In the name of full disclosure, I will admit that when I saw that Numina and Zero Ohms had joined forces, I made a happy sound. I have been following and admiring both artists throughout their careers, so the idea of these talents merging sent me into a bit of ambient-music-lover overdrive. Broken Stars Through Brilliant Clouds is pretty much everything I expected: a lush, deep, far-reaching journey built on Numina’s synths and Ohm’s electronic wind instrument. It is also exceedingly quiet, reveling in an underplayed, droning breathiness that sets the mind drifting. This is the music you want playing quietly in the background as your night winds down, and it’s music you want whispering through your headphones to take you as far down as possible. While the music is crafted in gossamer wisps, there is still ample movement, dynamics, and detail. Ohms’ flute rises in places, deliciously organic and solid amid the flow. The opening track, “Secrets of the Treasure House of Stars,” is about the “biggest” piece here, the one with the most up-front presence. The duo bring it up from near-silence and guide it toward a great spacemusic feel, a classic sound of big-yet-soft pads floating off to some distant spot and a well-balanced hint of drama. “A Day Without Time” brings the flute and EWI toward the front and truly sets us drifting. The pads here move nicely in your head, rolling gently back and forth like waves and every bit as lulling. From here, Broken Stars… gets very quiet, more of an insinuation of feeling than a conscious listen, its strong moments not intrusive enough to bring you back to the surface but able to stir something in you. The title track has its breathtaking moments, but manages to do so just through some shift in harmonies, or the brightness of a chord. On “Night of the Falling Planets,” the duo nudge us toward darkness, but even there we watch from a distance, still adrift and unconcerned, as it rolls in and we watch it make its way past. This track hits a point of sparseness that show how much these two can do with very little, and that they know when to bring the ride back around. A nice piece of drone-centered work. And then, as if to welcome us back from this very deep journey we’ve taken to elsewhere, we arrive at “Of An Uncertain Mythos.” This is an interesting surprise, so I won’t reveal it here—trust me when I tell you that it pays off, and its drastic departure from the tracks before it feels actually quite cleansing. Soft drones are at play here as well, with long notes from the EWI playing quietly in the background. It’s an unusual choice, but they make it work. Broken Stars Through Brilliant Clouds needs to be given its looping space. This is where it really thrives, its softness quietly expanding to fill your space. Its emotional core comes through at any volume. Of course, headphones will just augment the intimate feel of the album. Regardless of how you listen, this is a must-hear. 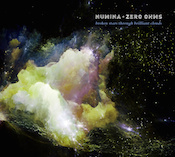 Numina and Zero Ohms are a perfect pairing and they have created a standout album. Look for this on your “Best of 2015” lists. I guarantee it’ll be there.